For adults, losing teeth may represent the beginning of a variety of future health challenges. According to a new international study, adult tooth loss has links to a number of known risk factors for heart disease- including smoking, high blood pressure, obesity, and diabetes- and could serve as an early warning for individuals to take their heart health more seriously. While tooth loss may only seem like a problem for the elderly, tooth loss can actually happen at any age. In the U.S., the average person between the ages of 20 to 34 has roughly 27 permanent teeth; a complete set of adult teeth includes 32 teeth. Not surprisingly, however, as people age, the number of permanent teeth they have remaining tends to decrease; those between the ages of 35 and 49 have an average of 25 teeth remaining, while those 50 to 64 have roughly 22. Of seniors 65 and older, 25 percent have lost all of their remaining permanent teeth. 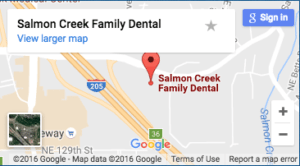 Here at your best choice for Vancouver Washington dentist, Salmon Creek Family Dental, Dr. Nelson wants to make sure you have all the info about the connections. As part of the study, researchers from Sweden’s Uppsala University examined the medical records of 16,000 people from 39 countries who completed surveys on their remaining number of teeth and how frequently they experienced bleeding gums. Roughly 40 percent of the study’s participants had less than 15 teeth and 16 percent had no remaining teeth; 25 percent reported experiencing bleeding gums. Researches found a direct correlation between the fewer number of teeth a person had and an increase in the number of harmful enzymes that help to cause inflammation and the hardening of arteries. Researchers also noted that in addition to having fewer teeth, study participants tended to show an increase in other markers for heart disease, including levels of LDL cholesterol and elevated blood pressure, blood sugar, and weight gain. Participant who had fewer teeth were also more likely to suffer from diabetes, with a person’s risk increasing 11 percent for every significant reduction in the number of teeth they had remaining. Additionally, the study found that individuals who were either a former or current smoker also had an increased risk of tooth loss, and participants who suffered from bleeding gums had a higher risk of suffering from high blood pressure or cholesterol. For over 100 years, dentists and cardiologists have long suspected a connection between heart disease and oral health. While proponents of the most prominent theories linking the two have yet to find any substantial corroborative evidence, a consensus in the medical community is that more research is needed. Inflammation caused by gum disease can spread throughout the body, and cause inflammation to occur in other regions, including the heart. This inflammation can cause a narrowing of arteries, which increase a person’s risk of heart attack. Dental plaque, a primary cause of oral heath problems such as tooth loss, enters the blood stream through bleeding gums where it eventually makes it way to the heart. Once there, the dental plaque contributes to the buildup of arterial plaque, which can also cause a narrowing of the arteries and increase the risk of heart attack. Until more conclusive evidence is collected, researcher continue to recommended that adults work to take better care of their oral health in order to help reduce their risk of heart disease. If brushing wasn’t already important enough, this study provides just one more reason why taking care of your teeth and gums should also remain a top priority.